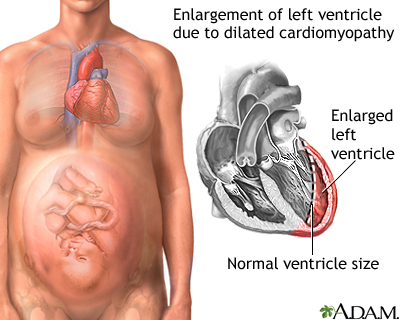 Dilated cardiomyopathy is a condition in which the heart becomes weak and the chambers get large. 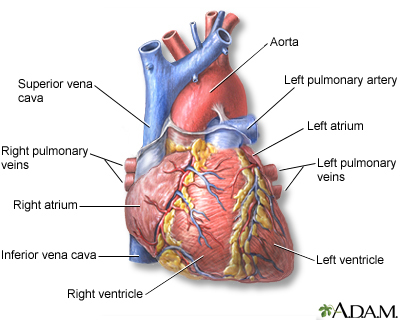 As a result, the heart cannot pump enough blood out to the body. It can be caused by many medical problems. 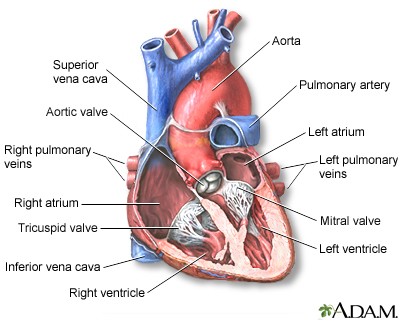 Recently, implantable artificial heart pumps have been developed. These may be used for very severe cases. However, not all people need or are able to have this advanced treatment. Falk RH, Hershberger RE. 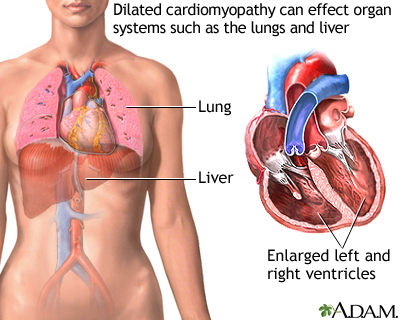 The dilated, restrictive, and infiltrative cardiomyopathies. In: Bonow RO, Mann DL, Zipes DP, Libby P, Braunwald E, eds. Braunwald’s Heart Disease: A Textbook of Cardiovascular Medicine. 10th ed. Philadelphia, PA: Elsevier Saunders; 2015:chap 65. 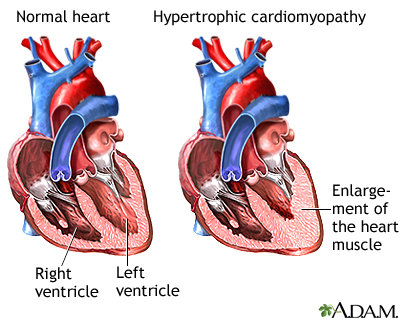 McKenna WJ, Elliott P. Diseases of the myocardium and endocardium. In Goldman L, Schafer AI, eds. Goldman’s Cecil Medicine. 25th ed. Philadelphia, PA: Elsevier Saunders; 2016:chap 60. McMurray JJV, Pfeffer MA. Heart failure: management and diagnosis. In Goldman L, Schafer AI, eds. Goldman’s Cecil Medicine. 25th ed. Philadelphia, PA: Elsevier Saunders; 2016:chap 59. O’Connor CM, Rogers JG. 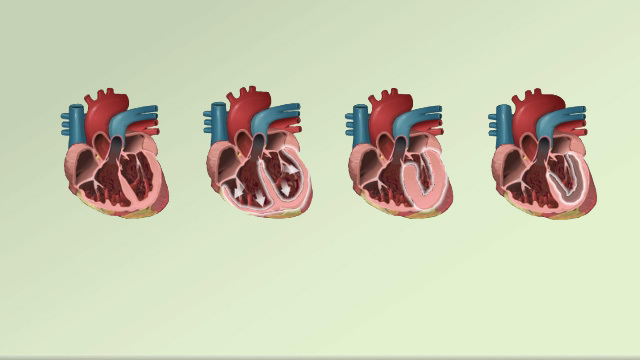 Heart failure: pathophysiology and diagnosis. In Goldman L, Schafer AI, eds. Goldman’s Cecil Medicine. 25th ed. Philadelphia, PA: Elsevier Saunders; 2016:chap 58. Michael A. Chen, MD, PhD, Associate Professor of Medicine, Division of Cardiology, Harborview Medical Center, University of Washington Medical School, Seattle, WA. Also reviewed by David Zieve, MD, MHA, Isla Ogilvie, PhD, and the A.D.A.M. Editorial team.